April 2007-till date: Professor, Marketing. 1993-2005: Associate Professor Marketing(last designation) . Cumulative Twelve years of teaching, training and research experience, with FORE School of Management, New Delhi in the areas of Marketing and Research. Alongside teaching completed some important research projects and consultancies with National and International clients. Best professor in Marketing Management: National leadership award: Dainik Bhaskar and Dewang Mehta foundation awards. Mumbai October 23rd 2013. Direct admission and scholarship for the Phd Program in Delhi University. August 2008: Trained in the Case method of teaching by the Harvard School of Business, USA- she was awarded a Goldman Sachs sponsorship for undertaking this course. October 2014: Big data analytics, certification by Wiley. Core marketing –marketing management I &II; Consumer behavior ; Marketing research ;Research Methodology ; Marketing of services; qualitative market research; negotiation skills-Marketing; International consumer behavior ,Retail consumer behavior. Guiding two FPM scholars at IMI, New Delhi. Part of the FPM committee for one FPM scholar. 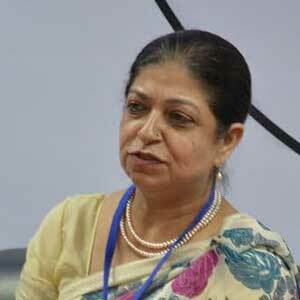 Brief Profile: Dr. Neena Sondhi, is the Head Research & chairperson FPM programs at International Management Institute, New Delhi. She has a diverse 20+ years of diverse teaching, research and consultancy experience. An alumnus and a merit holder from the Faculty of Arts, University of Delhi, she has successfully managed senior administrative roles in the organisation. She is a well-respected external examiner for Ph.D. and Fellow Programs of reputed universities; as well as a recognized reviewer for reputed International journals from Emerald, Sage, Inderscience. She is also on the examination and review board of collaborative (European and Indian schools) academic Marketing programs. AWARDS & FELICITATIONS: Dr. Sondhi was been felicitated for her academic and professional work by various bodies. 2013: She was awarded the “Best teacher in marketing management” award in 2013 by the Dainik Bhaskar and Dewang Mehta foundation. 2015: In 2015, her paper on organic consumption was judged as the best research paper 2015 by Emerald Publishing. 2017: In 2017, her Case study titled Clubb international private limited: marching ahead to new travels was judged as the prize winning best case amongst more than 100 International cases in the ISB-Ivey International case competition. In December 2017, her paper on Shopping cart abandonment was judged as the best research paper at the fifth ITQM conference, 2017. In October 2018 her Case study titled Nappa Dori: crafting the brand strategy was judged as the prize winning best case in the Marketing category amongst more than 100 International cases in the ISB-Ivey International case competition. In October 2018 her Case study titled Saregama: repositioning the value proposition was judged as the top 10 cases in Management amongst more than 100 International cases in the ISB-Ivey International case competition. Sondhi.N. (2017) :"Consumption of organic food:an emerging market perspective .International Journal of Managment practice.vol.10(1) pp. 30-48. Sondhi.N., Sharma.B.R. and Kalla.S.M. (2017) : Customer engagement in the Indian retail banking sector: an exploratory study". International Journal of Business Innovation and Research. Vol.12(1). pp.41-61. Sondhi. (2015): “Empirical analysis of online purchase of kids’ products by urban Indian parents. International journal of Electronic marketing and retailing. (Inderscience journal). 2015 Vol. 6(3).pp 214-238. Sondhi.N. and Chawla.D. (2008) :’Work exhaustion- A consequential framework: Validating the model in the Indian context” The Indian Journal of Industrial Relations, vol. 9, No. 2, July-Dec, 2008. Sondhi.N. (2017) : Nourishco Beverages limited: Making New Inroads. Published with Ivey Publishing . Product number W17715. Now available at Harvard Business Publishing. Sondhi.N. (2017) : Tata Gluco Plus: Building the brand Identity. Published with Ivey Publishing . Product number W17718. Now available at Harvard Business Publishing. Sondhi.N. & Basu.R. (2018) : Clubb International :Revisiting the Marketing strategy Published with Ivey Publishing . Product number 9B18A009. This is the award winning case that won the first prize at the ISB-Ivey Global Case competition. Sondhi.N. (2010) : Presented a research paper titled "Segmentation analysis: An empirical study of the two-wheeler owner's purchase intentions for the small car-Nano" in the ANZMAC (Australian and New Zealand Marketing Academy) conference 2010. Conference theme - "Doing More with Less". Held on 29 November – 1 December 2010 at University of Canterbury, Christchurch, New Zealand. Chawla.D. and Sondhi.N. (2015):“ Attitude and consumption patterns of the Indian chocolate consumer: an exploratory study” .At Apeejay School of Management,Dwarka, New Delhi for the 3rd Conference of Marketing Scholars and Practitioners (CMSP-2015) Emerging trends, Opportunities and Challenges at the Dwarka Campus on June 26, 2015. Mehta.C. and Sondhi.N. (2015)( conference paper)Understanding Indian consumers’ retail investor behavior: an empirical study. International conference on advancements in management and technology. JIIT, Noida campus. 18-20th December 2015. Sondhi.N. (2018): New Age Leadership And Strategic Models To Define Business Environment Of India In The Coming Decade. Businessworld, 31st March 2018. “An idea that worked Sirji: Conscientious Communication” – Asian Age, March 4, 2010. “Resonating communication”. Asian Age, June 4, 2010. "Out of Home communication"-17th February 2011- Asian Age. "Out of home innovations"-17th march 2011, Asian Age. “The before –after promise”- 13th September 2012, Asian Age. “The august freedom that we all strive for”.22nd august, 2013, Asian age. “Changing times reflected in media”. 29th September, 2014. Russell W. Belk,(ed) Handbook of Qualitative research methods in marketing, Edgar Elgar Publishing limited, 20063. Global Business review, Vol. 8.2July-dec2007 issue. Wilson.J. : "Essentials of Business Research-A guide to doing your research project" Global Business Review Vol12,No.2,June 2011, Pg. 343-344. October 2014-November 2014: Program coordinator ITEC Course in Excellence in Public Services through Market Orientation. 2006-2014 : Taken sessions in both in-company and open programs for : Spencers; Jaypee hotels; hero Honda; ONGC; EIL; IOCL; Joint Faculty program director for open program on Selling and Negotiation skills; ITEC programs. 2005-2006: Conducted various in-house programmes for ONGC, GHCL, STG, Hero Honda and Delphi labs. Feb/sep 2004- conducted 2 five-day programme on Market research for ISS officers. - External reviewer for Sage India, Pearson Education and Macmillan India Limited. - External Phd guide for two scholars under the AIMA-AMU scheme. Bhatia.R., Khan.M.N.adn Sondhi.N. (2017) :"A conceptual framework for green buying behaviour: an emerging market perspective" SEventh International Marketing conference held at Indian Institute of Management-Ahmedabad. Sondhi .N(2017) : “Segmenting and profiling the deflecting customer: understanding shopping cart abandonment” presented at the 5th International ITQM conference( organized by International Academy of Information Technology and Quantitative Management, at JIIT NOIDA in December 2017. The paper has been published in Elsevier Procedia . Was awarded the Best research paper at the conference. Sondhi .N(2017) : “ A Tri-component Model for assessing attitude towards counterfeit Luxury: Scale Development & Validation.” presented at the 5 th International ITQM conference( organized by International Academy of Information Technology and Quantitative Management, at JIIT NOIDA in December 2017. The paper has been published in Elsevier Procedia . Joshi.H and Sondhi.N. (2018): Antecedents & Consequences of FoMo: An Exploratory Study of Young Urban Adults. JAMS conference 26-28th April, 2018. ISB hyderabad. 1. Trained in the Case method of teaching by the Harvard School of Business, USA- she was awarded a Goldman Sachs sponsorship for undertaking this course.